The Pamlico County Sheriff's Office is led by Sheriff Chris Davis. 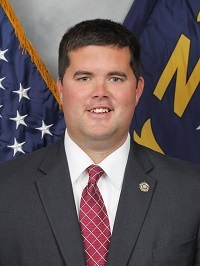 His office is located in the Law Enforcement Center at 200 Main St, Bayboro. The Law Enforcement Center also houses offices of the County Magistrate’s Office and Pamlico County Detention. The Pamlico County Sheriff's Office has responsibility in three areas of the criminal justice system: law enforcement, the courts and corrections and is responsible for the county communications. The Sheriff’s office also is responsible for numerous other law enforcement duties. The Pamlico County Sheriff's Office is responsible to enforce North Carolina laws in Pamlico County. The responsibilities include county patrols, investigating crime and apprehending suspects. Within the Town of Oriental, that responsibility is shared with the Oriental Police Department. The Sheriff's Office maintains and operates the county detention center, to include supervising inmates and protecting their rights. It is also responsible for providing inmates with food, clothing, exercise, recreation and medical services. The Sheriff's Office administers the county communications office. Responsibility includes taking emergency 911 calls 24 hours a day, seven days a week and dispatching law enforcement, ambulance, rescue squad, fire department, forest service and/or wildlife personnel to take appropriate action. Fingerprinting is conducted at the Sheriff’s Office on Tuesdays and Thursdays from 8 am to 4 pm. There is a $10.00 fee per person. The Pamlico County Sheriff's Office is manned 24/7, however, citizens are encouraged to conduct business of a non-emergency nature during normal, weekday business hours.